Last weekend Malicious pulled off, on paper, a big upset against Morning Wood. 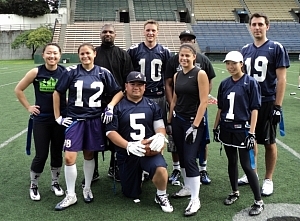 Then on Sunday, they put together back to back 40-34 victories against Justice League and Pain Train. While the upset against Justice League was a thriller, it could not compare to what transpired down the stretch of the final. After breaking a tie and going ahead by 8 with a little more than two minutes to go, Malicious appeared to have the game in hand. However Pain Train wanted to write their own story-book ending and heroically drove down the field to score a touchdown and convert the 2 to tie the score at 34 with 28 seconds to go. But that was just enough time for Reth Bon and Melissa DeRoos to complete a couple of key passes, none bigger than the touchdown on the final play of the game. Congratulations to Malicious!